No check-in Wednesday this week so I’m doing a little week review instead. We didn’t do anything too exciting other than the usual. We finally got around to buying new shoes for Diego. 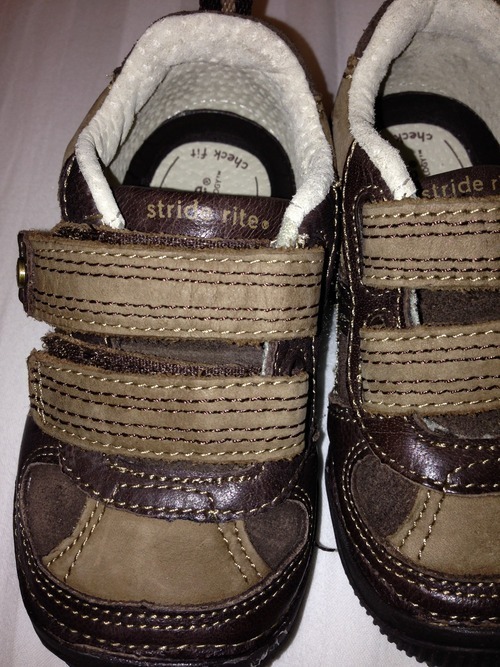 We decided to go to Stride Rite because I wanted him fitted properly as I suspected that he has a wide foot. He does indeed have one and now that I know this I can shop around for shoes online with confidence should I ever want to or need to. 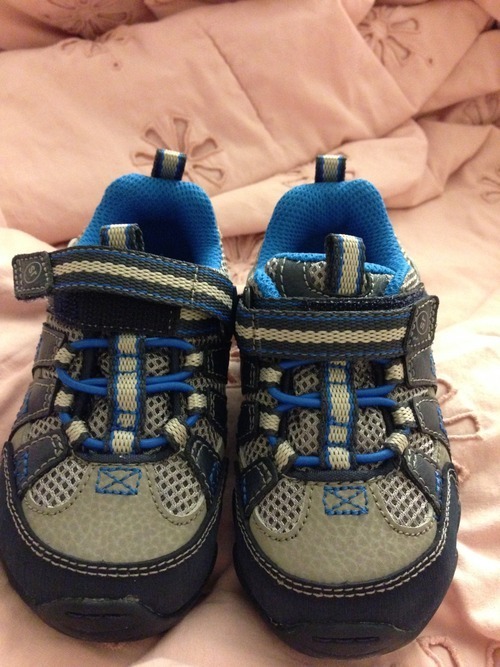 They were having a sale at Stride Rite where you bought a pair and got a second half price. We took advantage of this and bought him a pair for him to use now and a pair half a size bigger for when he outgrows them. If it were up to me I would have gotten him two pairs of the same shoe but my husband wanted something different. Today we met up with some friends at the park for a playdate. Their little boy is about a month older than Diego. He is a lot taller than him, too, which isn’t surprising considering that neither my husband nor myself are tall. He will likely be a small fry his whole life. They’re still at that age where they parallel play but it was still fun to spend time with friends. Afterwards, the three of us went to Panera for lunch. Diego and I shared some Mac and Cheese but he wasn’t really into it and spent most of his time eyeing his dad’s sandwich. Lunch was followed by a nap for the three of us. Diego slept for just over two and a half hours, which was nice. You would think that after such a great nap Diego would have been a better sport during our shopping trip. He was a complete nightmare from the moment we arrived. He just didn’t want to be in the shopping cart and there was no distracting him. I am not sure if maybe we’ve just reached the phase where we can’t take him grocery shopping anymore. On one hand having him whining was annoying and I’m sure other patrons didn’t appreciate it. However, their comfort is really none of my concern. I mean, kids whine and make noise on occasion and a grocery store isn’t a library. I’m trying to balance teaching Diego that sometimes we need to do things we don’t want to do with saving my sanity along with that of the people around me. I think next time we need to do a big grocery haul we will just split up. One of us will stay home with Diego while the other gets things done. 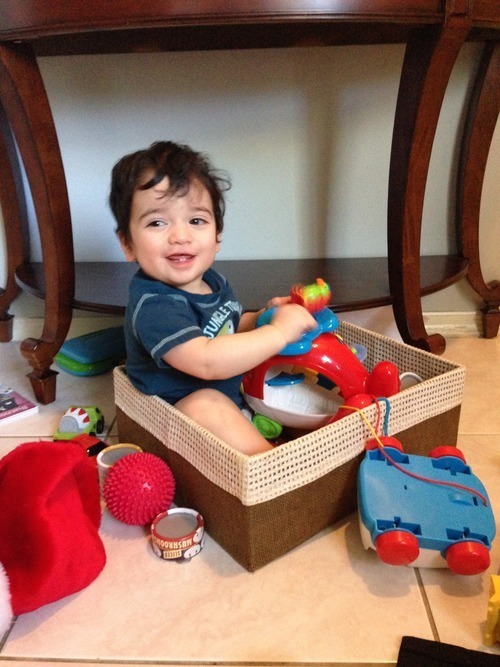 Diego decided that his toy basket made a good place to sit. 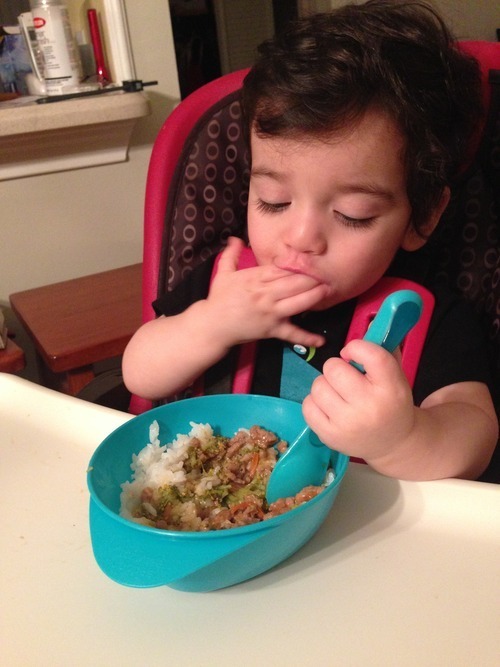 He loved the veggie stir fry we had for dinner on Tuesday. 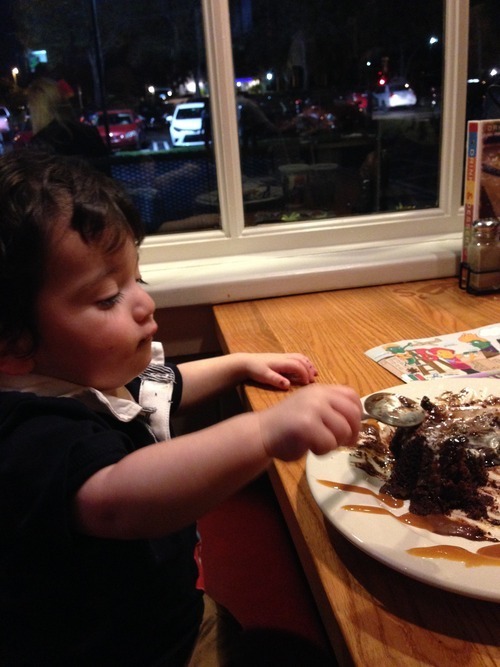 He enjoyed his first taste of a Chocolate Molten at Chilli’s. 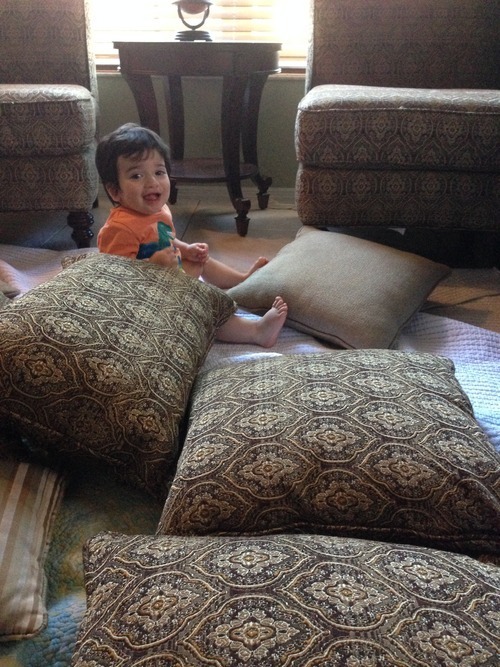 He loved making a mess of our living room with our pillow fort. 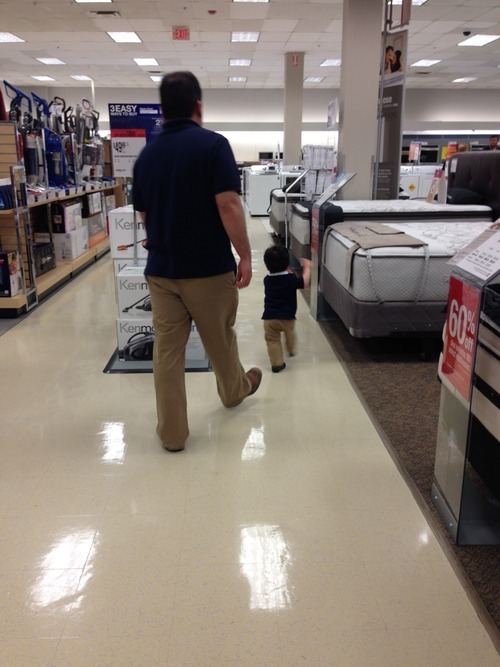 Running around the mall dressed just like his Daddy. 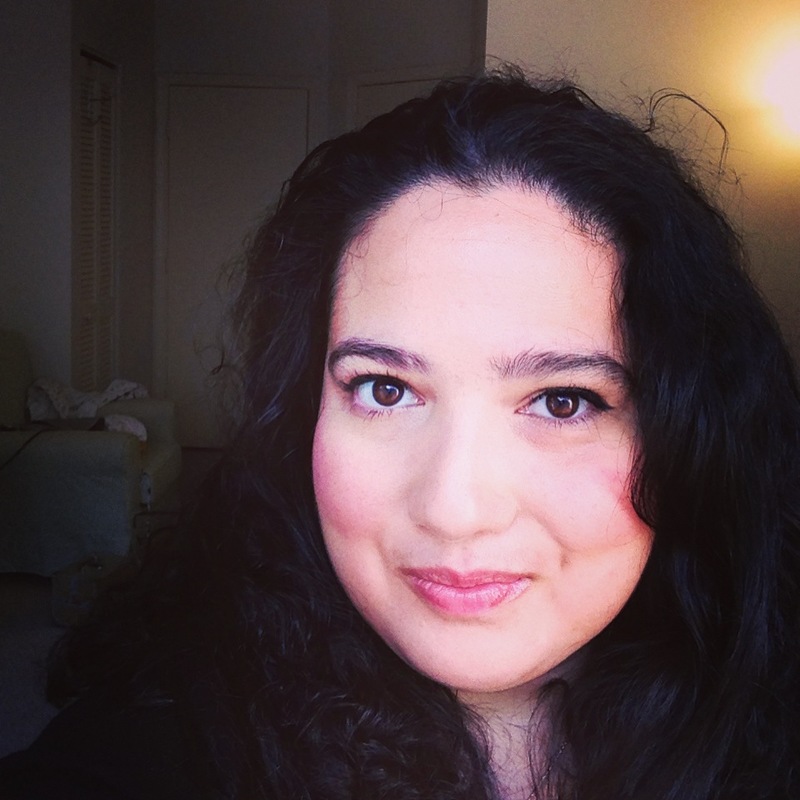 Posted in Uncategorized on February 17, 2014 by abbydlr.